The German city of Cologne was bombed in 262 separate air raids by the Allies during World War II, all by the Royal Air Force (RAF) but for a single failed post-capture test of a guided missile by the United States Army Air Forces. A total of 34,711 long tons of bombs were dropped on the city by the RAF. While air raid alarms had gone off in the winter/spring of 1940 as British bombers passed overhead, the first bombing took place on 12 May 1940. The most notable attack on Cologne was the first 1,000 bomber raid on 30/31 May 1942. It was expected that the devastation from such raids might be enough to knock Germany out of the war or at least severely damage German morale. The raids were useful propaganda for the Allies and particularly for RAF Bomber Command head Sir Arthur Harris, 1st Baronet's concept of a Strategic Bombing Offensive. Bomber Command's poor performance in bombing accuracy during 1941 had led to calls for the force to be split up and diverted to other urgent theatres i.e. Battle of the Atlantic. A headline-grabbing heavy raid on Germany was a way for Harris to demonstrate to the War Cabinet that given the investment in numbers and technology Bomber Command could make a vital contribution to victory. At this stage of the war Bomber Command only had a regular front line strength of around 400 aircraft, and were in the process of transitioning from the twin engined medium bombers of the pre-war years to the newer more effective four-engined heavy bombers such as the Handley Page Halifax and Avro Lancaster. By using bombers and men from Operational Training Units (OTUs), 250 from RAF Coastal Command and from Flying Training Command, Harris could easily make up the 1,000 aircraft. However, just before the raid took place, the Royal Navy refused to allow the Coastal Command aircraft to take part in the raid. The Admiralty perceived the propaganda justifications too weak an argument against the real and pressing threat of the U-boats in the Battle of the Atlantic. Harris scrambled around and, by crewing 49 more aircraft with pupil pilots and instructors, 1,047 bombers eventually took part in the raid, two and a half times more than any previous raid by the RAF. In addition to the bombers attacking Cologne, 113 other aircraft on "Intruder" raids harassed German night-fighter airfields. Cologne was not Harris's first choice; he wanted to bomb Hamburg. Poor weather made Hamburg a poor choice; in addition, Harris was advised by Dr. Basil Dickins, a scientist who was section head of RAF's Bomber Command's Operations research, to choose Cologne, which was within GEE range. This was the first time that the "bomber stream" tactic was used and most of the tactics used in this raid remained the basis for standard Bomber Command operations for the next two years and some elements remained in use until the end of the war. It was expected that such a large number of bombers flying in a bomber stream through the Kammhuber line would overwhelm the German night fighters' control system, keeping the number of bombers shot down to an acceptable proportion. The recent introduction of GEE allowed the bombers to fly a given route at a given time and height. The British night bombing campaign had been in operation for some months, and a statistical estimate could be made of the number of bombers likely to be lost to enemy night fighters and flak, and how many would be lost through collisions. Minimising the former demanded a densely packed stream, as the controllers of a night fighter flying a defensive 'box' could only direct a maximum of six potential interceptions per hour, and the flak gunners could not concentrate on all the available targets at once. Earlier in the war four hours had been considered acceptable for a mission; for this raid all the bombers passed over Cologne and bombed in a window of 90 minutes, with the first having arrived at 00:47 of 31 May. 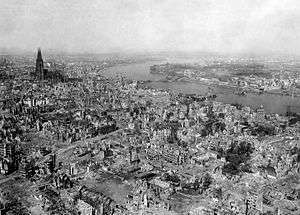 It was anticipated that the concentration of bombing over such a short period would overwhelm the Cologne fire brigades and cause conflagrations similar to those inflicted on London by the Luftwaffe during the Blitz. In the raid, 868 aircraft bombed the main target with 15 aircraft bombing other targets. The total tonnage of bombs dropped was 1,455 tons with two-thirds of that being incendiaries. Two and a half thousand separate fires were started with 1,700 classed by the German fire brigades as "large". The action of fire fighters and the width of the streets stopped the fires combining into a firestorm, but nonetheless most of the damage was done by fire and not directly by the explosive blasts. 3,330 non-residential buildings were destroyed, 2,090 seriously damaged and 7,420 lightly damaged, making a total of 12,840 buildings of which 2,560 were industrial or commercial buildings. Among the buildings classed as totally destroyed were: 7 official administration buildings, 14 public buildings, 7 banks, 9 hospitals, 17 churches, 16 schools, 4 university buildings, 10 postal and railway buildings, 10 buildings of historic interest, 2 newspaper offices, 4 hotels, 2 cinemas and 6 department stores. The only military installation damaged was the flak barracks. The damage to civilian homes, most of them apartments in larger buildings, was considerable: 13,010 destroyed, 6,360 seriously damaged, 22,270 lightly damaged. The number reported killed was between 469 and 486, of whom 411 were civilians and 58 combatants. 5,027 people were listed as injured and 45,132 as "bombed out". It was estimated that from 135,000 to 150,000 of Cologne's population of nearly 700,000 fled the city after the raid. The RAF lost 43 aircraft (German propaganda claimed 44), 3.9% of the 1,103 bombers sent on the raid. 22 aircraft were lost over or near Cologne, 16 shot down by flak, 4 by night fighters, 2 in a collision, and 2 Bristol Blenheim light bombers lost in attacks on night fighter airfields. A posthumous Victoria Cross was awarded to Flying Officer Leslie Thomas Manser who sacrificed himself so his crew could abandon the aircraft. 1940-05-1817/18 May 1940 RAF Six Wellingtons bomb the railway yards. 1942-02-1413/14 February 1942 RAF 39 aircraft encountered ice and cloud, poor bombing results reported. 1942-03-1313/14 March 1942 RAF 135 aircraft bombed involved in the raid. The raid killed 62 and injured a further 84. 237 separate fires were started and the RAF estimated the raid to be five times more effective than average of recent raids on Cologne. This is considered to be the first successful GEE led raid. The RAF lost one Avro Manchester. 1942-04-055/6 April 1942 RAF 263 aircraft. 1942-04-2222/23 April 1942 RAF 69 aircraft. 1942-04-2727/28 April 1942 RAF 97 aircraft. 1942-05-3030/31 May 1942 RAF 868 aircraft bombed Cologne during the first 1000 bomber raid (1,047 aircraft), laden with over 3 million kg of ordnance. 1942-05-31-0131 May 1942 RAF Photo reconnaissance by 5 de Havilland Mosquitoes of No. 105 Squadron RAF. 1942-05-31-0231 May/1 June 1942 RAF Two aircraft. Conditions were cloudy over Cologne so no bombing was undertaken. Both aircraft returned to base. 1942-07-2626 July 1942 RAF 3 Mosquitoes in a nuisance raid. 1942-08-1010 August 1942 RAF Single Mosquito on a nuisance raid, bombs and returns to base. 1942-08-2525 August 1942 RAF 4 Mosquitoes to Germany on nuisance raids, one of them to Cologne, three complete their mission and bomb. One lost. 1942-09-022 September 1942 RAF 1 Mosquito on a nuisance raid, bombs and returns to base. 1942-09-022 September 1942 RAF 2 Mosquitoes on a nuisance raid, bomb through cloud and return to base. 1942-09-077 September 1942 RAF 1 Mosquito on a nuisance raid, bomb through cloud and return to base, no record of the bombing on the ground. 1942-11-1515/16 October 1942 RAF 289 aircraft. 1943-01-2222/23 January 1943 RAF This was the first raid on Cologne using "Oboe" navigation, two Mosquitoes damaged 55 houses, killing 5 people and 22 injured. This showed that using electronic aids a few bombers were able to inflict as much damage as 100-bomber raids in poor weather in the previous years. 1943-02-022/3 February 1943 RAF 161 aircraft. 1943-02-1414/15 February 1943 RAF 243 aircraft. 1943-02-2626/27 February 1943 RAF 427 aircraft. 1943-06-1313/14 June 1943 RAF 2 Mosquitoes bombed Cologne one of several nuisance raid. 1943-06-1616/17 June 1943 RAF 212 aircraft. 1943-06-1717/18 June 1943 RAF 2 Mosquitoes bombed Cologne, one of several nuisance raids. 1943-06-1919/20 June 1943 RAF 6 Mosquitoes to Cologne, Duisburg and Düsseldorf (the main attack was against Le Creusot). 1943-06-2222/23 June 1943 RAF 4 Mosquitoes as a diversionary raid, (the main attack was against Mülheim). 1943-06-2323/24 June 1943 RAF 3 Mosquitoes on a nuisance raid. 1943-06-2828/29 June 1943 RAF 608 aircraft. 1943-07-022/3 July 1943 RAF 3 Mosquitoes on a nuisance raid. 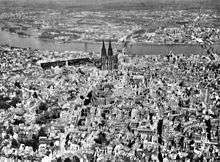 1943-07-033/4 July 1943 RAF 653 aircraft attacked the Cologne's industrial area on the east bank of the Rhine. A new German unit, the Jagdgeschwader 300, used the Wilde Sau tactic in single engined fighters for the first time. 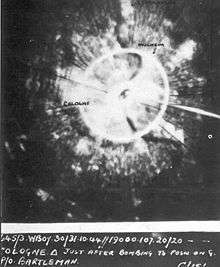 The German fighters, taking advantage of the illumination from searchlights, target indicator flares and fires claimed that they shot down 12 aircraft, but had to share their claims with the anti-aircraft batteries who also claimed the downings. To avoid friendly fire losses, anti-aircraft batteries restricted the height of their flak and the fighters operated above that pre-agreed ceiling. 1943-07-055/6 July 1943 RAF 4 Mosquitoes on a nuisance raid. 1943-07-066/7 July 1943 RAF 4 Mosquitoes on a nuisance raid. 1943-07-077/8 July 1943 RAF 4 Mosquitoes on a nuisance raid. 1943-07-088/9 July 1943 RAF 288 aircraft. 1943-07-1313/14 July 1943 RAF 2 Mosquitoes on a diversionary raid drop target indicators (the main raid was on Aachen). 1943-07-2525/26 July 1943 RAF 3 Mosquitoes on a diversionary raid (the main raid was on Essen). 1943-08-044/5 August 1943 RAF 5 Mosquitoes Cologne and Duisburg through cloud. 1943-08-077/8 August 1943 RAF 4 Mosquitoes in a nuisance raid. 1943-08-1111/12 August 1943 RAF 8 Mosquitoes in a nuisance raid. 1943-08-2929/20 August 1943 RAF 4 Mosquitoes equipped with OBOE, with another 4 to Duisburg, in a nuisance raids. One Mosquito lost. 1943-09-011 September 1943 RAF 8 Mosquitoes were sent to Cologne and Duisburg. No Mosquitoes lost. 1943-09-044/5 September 1943 RAF 8 Mosquitoes were sent to Cologne and Duisburg. No Mosquitoes were lost. 1943-09-1313/14 September 1943 RAF 5 Mosquitoes equipped with OBOE with another 5 to Duisburg, in a nuisance raids. No Mosquitoes were lost. 1943-09-1918/19 September 1943 RAF 5 Mosquitoes on a nuisance raid. No Mosquitoes were lost. 1943-09-2424/25 September 1943 RAF 8 Mosquitoes to Cologne and Düsseldorf on nuisance raids. No Mosquitoes were lost. 1943-09-2626/27 September 1943 RAF 4 Mosquitoes to Cologne on a nuisance raid. No Mosquitoes were lost. 1943-09-2626/27 September 1943 RAF 8 Mosquitoes attacked Cologne and Gelsenkirchen on nuisance raids. These were the only Bomber Command sorties of the night. No Mosquitoes were lost. 1943-10-022/3 October 1943 RAF 8 Mosquitoes to Cologne and Gelsenkirchen on diversionary raids. The main raid was to Munich. No aircraft lost on the diversionary raids. 1943-10-033/4 October 1943 RAF 12 Mosquitoes equipped with OBOE bombed the Knapsack power-station near Cologne. No aircraft lost. 1943-10-1313/14 October 1943 RAF 4 Mosquitoes to Cologne on a nuisance raid. No Mosquitoes were lost. 1943-12-2222 December 1943 VIII Mission 163: 1 B-17 dropped two 2,000 pound (907 kF) general purpose bombs and 1 Photoflash at 2020 hours; no casualties. 1944-01-044/5 January 1944 RAF 2 Mosquitoes on a nuisance raid, both returned to base. 1944-02-022/3 February 1944 RAF 3 Mosquitoes on a nuisance raid, all returned to base. 1944-03-1717/18 March 1944 RAF 28 Mosquitoes bombed Cologne, all returned to base. 1944-03-2121/22 March 1944 RAF 27 Mosquitoes bombed Cologne, all returned to base. 1944-03-2929/30 March 1944 RAF 4 Mosquitoes on a diversionary nuisance raid, all returned to base (main raids Vaires, near Paris, and Lyons). 1944-03-2929/30 March 1944 RAF 34 Mosquitoes on diversions to Aachen, Cologne and Kassel, all returned to base, (but the main raid to Nuremberg resulted in the biggest Bomber Command loss of the war). 1944-07-1818/19 July 1944 RAF 6 Mosquitoes on a diversionary raid, part a night when the RAF made four substantial attacks and a number of small raids like that on Cologne. They attacked the synthetic oil plants at Wesseling and Scholven/Buer, railway junctions at Aulnoye and Revigny and a flying-bomb launching site at Acque. 1944-10-1414 October 1944 VIII Bomber Command Mission 677: As part of a round-the-clock bombing operation, PFF attacks were made on Cologne marshaling yards at Gereon, Gremberg, and Eifeltor; as well as Euskirchen 35 km outside Cologne. 1944-10-15 The 486 BG bombed Cologne. 1945-02-1212/13 February 1945 RAF 3 Mosquitoes on H2S radar trials. No aircraft lost. 1945-03-022 March 1945 RAF In the last RAF raid on Cologne, 858 aircraft bomb in two waves. Only 15 of the 155 aircraft in the second wave dropped their bombs. A daylight raid in good weather, the bombing was "highly destructive". 1945-03-022 March 1945 VIII A single B-17 bombed Cologne as a target of opportunity. 1945-03-025 March 1945 9th Tactical U.S. Army Air Force Fighters dropped leaflets in the Cologne-Bonn area. ↑ Nuisance raids forced the population into air raid shelters and activated other defence measures at little cost to the RAF. ↑ Sending bombers to several different locations was intended to confuse the Germans and so helped to make it more difficult for the defenders to direct fighters onto the main attack. ↑ The VIII Bomber Command had been redesignated as the US Eight Air Force. ↑ "Archived copy". Archived from the original on 2012-02-06. Retrieved 2012-02-15. "[The GB-1 Glide Bomb] was made from a M34-2000lb bomb fixed to a 12 foot span glider unit and attached to a B-17 underwing shackle. Two Glide bombs could be carried per plane. Essentially free fall, the bomb had a stabilizing device that allowed control of direction. The bomb proved to be unreliable on the only occasion it was used on Cologne in April 1944." ↑ Stadtlandschaften versus Hochstadt at www.koelnarchitektur.de "Internet portal for the architecture of Cologne". (In German). ↑ Wakelam, Randall Thomas (2009). The Science of Bombing: Operational Research in RAF Bomber Command. U of Toronto P. p. 86. ISBN 9781442693432. ↑ Winkelnkemper, Toni. "The Attack on Cologne". Der Großangriff auf Köln. calvin.edu. Retrieved 2009-03-20. ↑ RAF staff 2005, The Battle of France (May–June 1940). ↑ RAF staff 2005, March 1942. 1 2 3 4 "Campaign Diary: October 1943". RAF History - Bomber Command 60th Anniversary. Retrieved 18 July 2008. 1 2 3 McKillop, Jack. "8th Air Force 1944 Chronicles". airwarweb.net. Retrieved 2009-01-27.